site page views so far! Important - you'll need an up-to-date version of Acrobat Reader to open pdfs on this site. Built-For-Fun EV's - electric vehicle plans, building and hobby engineering site. 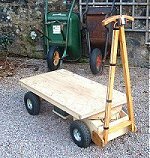 For several years now I've been designing and building small fun electric go karts, trikes, scooters and other mini vehicles. It started mainly for fun for the kids but also just out of interest - and some have been built for use around the garden - all have proved to be very effective and have been great fun to work on. You can see the DIY designs below - they include go karts, kids' trikes and scooters, a powered wagon for the yard, a 3/4 scale veteran style "Voiturette" and 1300W yard tractor. A projects have been DIY full motion cockpits for flight simulation and DIY linear actuator design, and there are a couple of early experimental vehicle designs too - a tandem buggy and a sporty single seater. Now added - a DIY Wi-Fi Robot. There are loads of pages on the site with lots of designs and design information, links to component and materials suppliers, a component search engine and great value plans for sale. So have fun looking around, I hope you find the site interesting. Over the last two or three years I've been adding lots of new material to the sister Flight Simulator motion platform and related projects web site - you can find it here. An interesting robotics project - a skid steered robot controlled remotely over your home wireless network. Plans and software NOW AVAILABLE - more details. A larger sized 1500W electric kart - depending on the gearing and driving conditions capable of speeds of about 20-25 mph. As simple as I can make it without compromising function - single stage reduction chain drive, dual 36V 750W motors, dual disc brakes, forward & reverse drive. Click on the image for more details - PRELIMINARY design plans available for this as a FREE bonus for Paid-For plans customers - see the Kart plans page. This projectis a practical yard/garden tractor intended for haulage duties about the yard. Click on the image to go to the Yard Tractor page. FREE assembly drawing previews are available through the Yard Tractor page. This one is mainly for the grown-ups! - inspired by the veteran / antique style car builders - it has a double motor 1000W drive - forward & reverse - front disc brakes - front & rear suspension - and is based on the 1898 Argyll / Renault Voiturette or Type A vehicles. Quiet, manoeuvrable, great fun to drive. FREE assembly drawing previews available Here! Forward and reverse drive - independent drive and braking to each rear wheel for manoeuvrability - Ackerman steering geometry - speeds up to 12 mph - click on the image for details. This one was the kids' favourite. FREE assembly drawing sheets available Here! Simple pivoting 3 wheeled scooter - either 250W single or 500W double motor drive - front disc brake - forward & reverse drive. Tilting frame is balanced like a bike and works well - fun watching the kids learn how to ride this one. 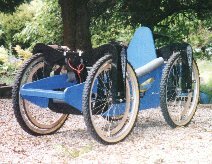 Basic trike - either 250W single or 500W double motor drive - front disc brake - forward & reverse drive. This was the simplest EV design I could think of and isn't much more than a drive box and some wheels. Fixed structure makes it easy to ride - just sit on it and go. Powerful 500W dual motor drive - highly manoeuvrable - forward & reverse "wig-wag" finger operated speed & direction control - removable side, front & back panels - manual tipping for light loads. Great in the garden for collecting grass clippings, leaves etc & generally moving stuff about. A more complex project than some of the kids' buggies - but plans for this older design are now FREE to download - click on the image and follow the links. At the mechanical heart of some of the kids' vehicles. I thought long and hard about how to make an effective gear box without specialist metal-working tools and came up with these. You could use them in your own kart, tank or even robot designs. This is how I started - novel but functional designs - complete plans aren't available for these 4WD off-roaders but I'd be happy to let you see what we've got - drop me an e-mail. The articulated tandem is one of the smoothest steering buggies I've built. � This site is copyrighted. If you'd like more information or have any comments please feel free to contact me. Copyright � 2005-2016 BFF Design Ltd All Rights Reserved.